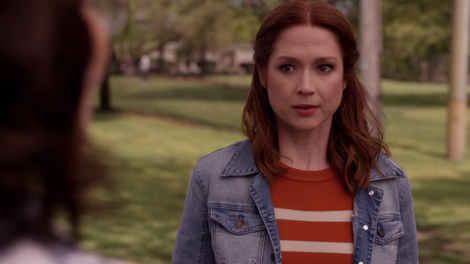 Unbreakable Kimmy Schmidt often takes conventional television plotlines or conventions and then “Kimmy-fies” them, either blowing them into ludicrous proportions or mapping them onto an unexpected setup. "Kimmy is in a Love Square!" Throughout “Kimmy is in a Love Square!,” there are several explicit reminders that the kind of affair Kimmy is having—one in which she is the “other woman” to two loving parents, who are “cheating on their son” with her—is not at all a thing. (Jacqueline balks throughout, and Kimmy looked it up on the internet, and the results were conclusive.) And yet the show finds funny ways to map a sexual affair onto Kimmy sneaking around behind Josh’s back with his parents. And on top of that, the actual emotions at play here are surprisingly grounded. Kimmy never got to have the kind of parental relationship Josh did. The things about his parents that annoy him—like when they forget the title for Madam Secretary—amuse Kimmy. She’s unjaded in the parents department, because her own weren’t really there for her even before and after she was locked away in the bunker. The way she becomes instantly bonded to Josh’s parents is heartbreaking and also deepens our understanding of Kimmy’s more childlike behaviors. This show has consistently done a great job of avoiding infantilizing her and instead contextualizing her behaviors. It totally tracks that she would get hot and heavy for Josh’s parents (in a non-sexual way) and then mistakenly use very sexual language to describe it. Unbreakable Kimmy Schmidt is at the top of its game here, grounding something truly absurd and “not a thing” and making it feel sincere and meaningful for this character. Titus’ Mr. Frumpus storyline, meanwhile, continues with the arrival of Ronan Farrow. The fact that this show got Ronan Farrow to play Ronan Farrow writing a story exposing Mr. Frumpus’ history of abuse (which goes all the way back to Lillian’s dead ex-husband Roland, leading to a Kenan Thompson cameo) speaks to the ways it holds our own reality up to a prism. Unbreakable Kimmy Schmidt very much grapples with the same systems of abuse and power structures that the real world does—but Kimmy-fied. And it does that distortion without downplaying the real-world issues its shining a light on. When Titus’ old nemesis Coriolanus comes forward with his own Mr. Frumpus story, he’s blacklisted by Hollywood and scrutinized, painted as a liar and attention-seeker in the same way that abuse victims are put through the ringer in real life when they come out. Only, in the scope of Unbreakable Kimmy Schmidt, that means a takedown from media outlet Fox Kids, hosted by an actual child. Despite puppets and jokes and zany developments like people dressing in shorts to the Tony Awards to show solidarity with victims, there’s considerable darkness throughout this storyline. Titus would normally still choose fame in the end, and perhaps because it’s end of the series and therefore there’s space for the characters to actually grow and change, things turn out differently this time. He empathizes with Coriolanus and tells his story to Ronan, hoping that it’ll help lend credibility to his nemesis and also bring down Mr. Frumpus. He mocks Kimmy—doing spot on impressions of both Kimmy and Lillian—when she tries to tell him it’s the right thing to do. But in the end, he still does it. Ellie Kemper’s spit take game is on fire. Dan Byrd is perfectly cast as the sweet but also-somehow-annoying Josh. The joke about a company spending a bunch of money on a logo rebrand only to have the logo change ever so slightly is so specific and yet so funny.